Born in the free city of Hamburg on June 2,1861. Like Wilhelm Scholz, whose principal successor he became, Gustav Brandt had a career completely dedicated to the Berlin satirical magazine Kladderadatsch. In the early decades of the magazine’s history, that is, from 1848 to about 1880, Scholz worked almost unaided, but in his old age a pleiad of fresh talent moved in for longer or shorter stints. Franz Juttner and Arthur Wanjura, for instance, arrived about the same time as Brandt but soon left the staff, whereas Brandt (always just one artist among many on the magazine) kept contributing up to the time of his death early in 1919. Brandt, who had thought he wanted to paint, studied at the academies of Dusseldorf and Berlin but went right from art school to a desk at Kladderadatsch. His contributions, which began in 1884, at first consisted of full pages in the supplement containing a host of vignettes on a given general topic (something like a Nell Brinkley page). His draftsmanship was brilliant, bustling and snappy from the very first, and he soon worked these vignette pages into interesting allover compositions (such as the 1890 page about the interviewers crashing the privacy of Bismarck’s retirement). By the turn of the century, however, Brandt had become a specialist in celebrity caricatures. These appeared in Kladderadatsch under the heading of Unsere Zeitgenossen (“Our Contemporaries”), a series that was continued by others after Brandt’s death. (An anthology album by the same name was published separately in 1902.) For his caricatures, which spoofed prominent Germans and other Europeans, Brandt generally used full-length figures with little or no background, the figures themselves being carefully shaded and modeled, with the faces finely rendered. 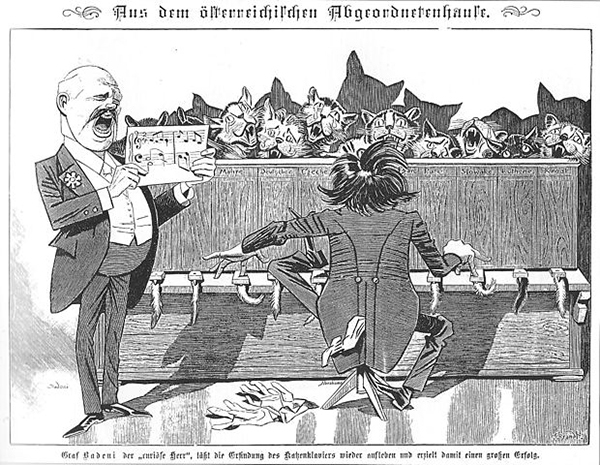 Eduard Fuchs, a historian of humorous art, declared early in this century that Brandt was the greatest living German caricaturist and the first one of world rank. In the 1910s a contributor to the Thieme-Becker (artists’ lexicon) flatly stated that Brandt was the outstanding artistic talent on Klad-deradatsch in his generation—an opinion difficult to dispute. 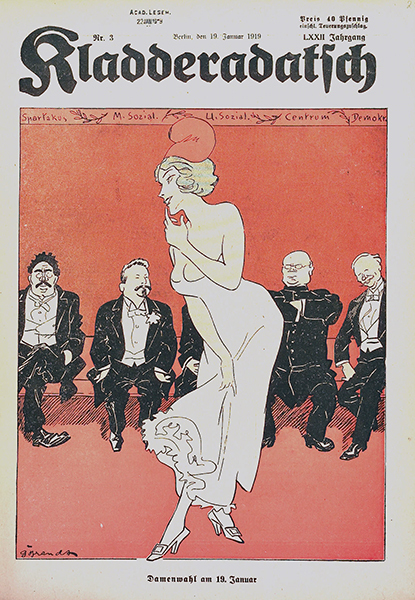 In his last years Brandt, who also did posters for Klad-deradatsch, was obviously fascinated by the great artists of the Munich Simplicissimus and drew full-page cartoons that are too strongly reminiscent of Gulbransson, Heine and Thony but are nevertheless at a comparable technical level.